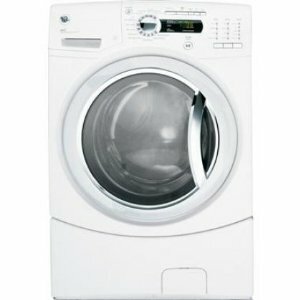 GE GFWS3500LWW White Frontload Washer 4.9 cu. ft. The GFWS3500LWW is a 27" washer from GE with a 4.9 cu. ft. capacity. This front load model distinguishes itself as a GE washer that has steam features. Its Steam Refresh feature aids in reducing odors and wrinkles while rejuvenating fabrics, while the other feature, Steam Assist, is responsible for penetrating into fabrics to break down soils and help get rid of tough stains. Since these are steam actions, you are guaranteed of effective but gentle cleaning that will not destroy even the more delicate items you need washed. This model is also equipped with the eWash option that uses cold instead of hot water in certain cycles, which save you energy costs. The washer is qualified for Energy Starand is rated CEE Tier III, which means it meets the guidelines set by federal law on energy efficiency on appliances. That means you get savings on utility costs and do your bit in saving natural resources. Its built-in Adaptive Vibration Control or AVC mechanism is a feature that prevents the machine from producing too much noise or vibration. No matter where you install this washer, the mechanism adjusts its spin patterns so you can enjoy silent operations without the usual mechanical rumbling or shaking. The Adaptive fill feature lets the washer fill the interior basin with the right amount of water corresponding to the load. With this automatic function, you are assured of not wasting any water. The washer is equipped with a see-thru glass door which allows you to have a view of the washer’s interior even when it is in the middle of the cycle. The glass window has a circular dark chrome frame. You can open and close the washer’s door through the TrueGrip handle that prevents slipping and easy maneuvering. The control panel located above the washer door has an LED cycle countdown and LED cycle status lights that inform you of the remaining time in a cycle. Should you feel that the sound made to end the signal is too shrill or loud, you can use the adjustable end-of-cycle signal. There’s also a delay start of up to 24 hours that allows you to use the machine even without you physically present. There’s also a safety Child Lock feature that prevents accidental washer door openings especially when it is in use. Overall capacity: 4.9 cu. ft. The eWash option is a handy feature for those who want to have clean items but not have to spend much on energy. For finicky users, the HydroHeater with sanitization makes sure that sanitized hot water is being used in washing and rinsing cycles, which also aids in getting rid of bacteria from laundry items as well as brightening white items. The washer is equipped with 5 built-in wash and rinse temperatures. With 12 wash cycle options including Washable Wools, Speed Wash, Drain and Spin, Active Wear, 2nd Rinse, PreWash and Stain Wash, there is something that corresponds to your preferences and your particular load. The patented Timed Flow-Thru dispensing system is applicable for all washing implements such as bleach, detergent, pre-treat solution and fabric softener. The front door is not reversible, which can be a disadvantage when you only have a small space to put the washer in.